This Pony Express station bears the name of explorer Captain James H. Simpson, a Camp Floyd topographical engineer, who stopped here in 1858 while laying out an overland mail route between Salt Lake City and California. The availability of excellent water made Simpson Springs one of the most prominent stations in the West Desert. 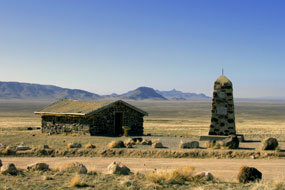 George Chorpenning established his second mail station at this site in 1858, which was later used by the Pony Express and the Overland Stage. A number of structures have been built and destroyed in the vicinity of Simpson Springs over the years. It is not known for sure which served as the station for the Pony Express. The current building is a replica, built in 1975 by the Future Farmers of America under the direction of the Bureau of Land Management. The BLM maintains interpretive wayside exhibits and a nearby campground. A monument was erected in 1965 to mark the station site. Additional information about BLM's "Backcountry Byway" along the original trail route may be found on the Salt Lake Field Office web site. From Salt Lake City, travel to Tooele via I-80 and continue south on Highway 36 to the signed Pony Express turnoff.